The word “legend” is one that is arguably thrown around too often in any context, but it’s no stretch at all to call Japanese movie star Toshiro Mifune “legendary.” Or “iconic” for that matter. The star of some of the greatest films ever made—never mind nation or genre, just GREATEST FILMS EVER MADE—the man was an exacting, electrifying performer. In documenting and celebrating his life and his films, you’d have to go very far wrong indeed to come out of the effort with something bad or uninteresting. Mifune put himself through a lot. He was a heavy drinker whose alcohol abuse ended up affecting his family life. His oldest son nevertheless remembers his father’s great “compassion.” The movie concentrates mostly on Mifune’s collaboration with Kurosawa, which yielded great pictures such as the groundbreaking “Rashomon,” “Samurai,” “The Hidden Fortress,” “Yojimbo,” and “Red Beard.” While it does not dig deep on what ended their collaboration (Martin Scorsese, also known as a director with a compelling long-term relationship with a single actor, now dormant, offers some fascinating rumination on the subject), its account of a sort of long-distance reconciliation is very moving. The movie’s clips are thrilling, and apt. 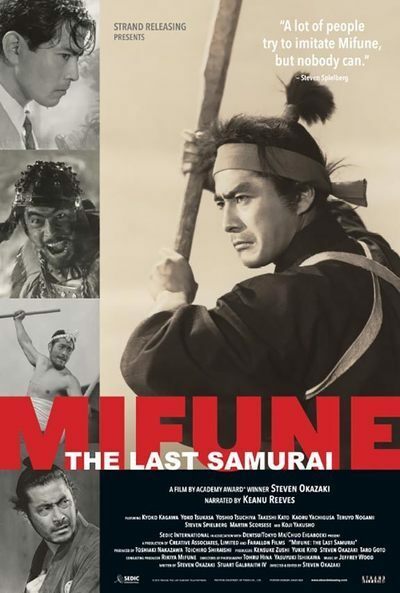 While I commend “Mifune: The Last Samurai” for its briskness, and its occasional crowd-pleasing playfulness—as when it introduces viewers to the actor who put on the rubber suit to play Godzilla the same year he was a samurai in Kurosawa’s classic—it’s a movie I myself could have stood to see more of. Fascinating Mifune/Kurosawa collaborations such as “Stray Dog” and “The Idiot” are given short shrift if mentioned at all. When going into Mifune’s international career, his role in “Hell In The Pacific,” in which he goes one-on-one with another icon/legend, Lee Marvin, is given the briefest of mentions. Last I looked, that movie’s director John Boorman is both alive and as voluble as ever. And so on. Again, these quibbles arise from the fact that this is a beginner’s guide, not a fest for fans. Is it too much to expect an expanded DVD edition though?